That's a question that I think about quite often. My family - father & sisters - live in another state. But when I was emailing last night about having a potluck dinner in a few weeks, I said "having dinner with family is down time!" And I mean it. More often than not, we are choosing and crafting our own families. We aren't restricting ourselves to those we share DNA with, but opening up to those we depend on daily to get thru this journey called life. The 18 stories in One Big Happy Family prove that the definition of family is fluid. Adoption social workers say that every woman needs to say hello to her baby before she can know if she can say good-bye. While our agency allowed "matches" as early as the seventh month, they stressed to us that a match was nothing more than a woman expressing her right to consider an adoption plan. It was not the promise of a baby, it was not a guarantee that we would be parents again. Suzanne Kamata's story of creating family in another country with traditional family rules is one for everyone with an in-law story. It's witty, heart-wrenching and somehow you end up with a smile at the end. You'll also never look at your Wii the same again. 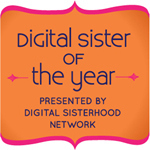 What would you do for your BFF? Would you marry him? That's what Liza Monroy does to keep her gay male BFF from having to return home to an ultraconservative country. This married chick relished that it's not just her "traditional" marriage that endures the debate over whose turn it is to do the dishes. Ah, love and marriage. Paula Penn-Nabrit pens an essay that voices so many concerns that are rarely expressed. What do we do, as a society, with the families of color who are, well, doing well for themselves? What do we do with children of color who aren't dragging the school test scores down? With all our talk of being post-racial, embracing diversity, the fact is that many people are still drawn to teaching & service to "help the less fortunate." Then there is Marc and Amy Vachon's contribution. Overall I loved it. Two people working to make egalitarian parenting work for them. What I didn't like is their premise that shared/egalitarian/5050 parenting is something that feminism failed to deliver. I don't like that premise because it makes one view feminism as a religion and that Gloria Steinem will swoop down on her wings. Rather I view feminism as the resource that gave us, men and women, the language to negotiate who will wash the dishes and raise our sons in a way that does not allow them to forget to bath the children. I can honestly say that I've never had to leave a list for my husband before a trip. He just knows what to do - he's our daughter's father. He's not the babysitter. He might not always have faith in his abilities, but he's come to see how awesome he is, even if I don't tell him enough. But that's our family. And that's the joy of One Big Happy Family. You get a peek into other families, you see how much we have in common and how we all get through it. In some ways it is ironic that Rebecca Walker, who has had a very public falling out with her mother is the same person who pulled together what could be a defining and accessible volume on what contemporary families really look like. On the other hand, she also defines why some of us need to craft families of our own. Buy this book to let legislators know America is challenging their assumptions about the definition of family. Buy it now and get it on the New York Times bestseller list, a message they will understand. Send them a copy with a personal note expressing your feeling that all American families have the right to be happy. Don’t let our leaders do to our families what they’ve done to the economy. If we let them define our families like they define health care, American families won’t stand a chance. I think that's a pretty darn good idea. 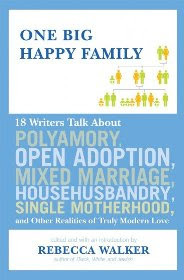 And you can buy One Big Happy Family : 18 Writers Talk About Polyamory, Open Adoption, Mixed Marriage, Househusbandry, Single Motherhood, and Other Realities of Truly Modern Love Edited by Rebecca Walker from an independent bookstore or Powells. They deliver! It's also ironic and somewhat hypocritical that Walker edited this book since she was also the one who very publicly proclaimed that she would never be able to love an adopted child (referring to her partner's child) as much as a biological child, and that while she would give up her life, if necessary, for a bio child, she would not for an adopted child. As a mother by adoption I was horrified by those comments which I thought were short-sighted and insensitive to families like mine, to say the least. I can only hope that Walker learned a thing or two about what makes a family, while editing this book.